The performance of networking and hard drive technology has come to a point where the gap has closed in. You can see that 3.5” hard drives can perform to the point where it can match with the available bandwidth on a network. So, using a NAS device to share your entire digital collection on a single network with one device is becoming much more available as a solution for various applications. When you have a centralized media center where data can be shared, information can be accessed easily from multiple client computers. Instead of using a physical medium like with a CD, DVD, flash drives, etc, and essentially only one person having access at a time, you would use a LAN as the medium to transfer data from one location to another – for example, your master and living room computer could stream the same movie at the same time. This saves you a lot of time and basically is more cost effective than purchasing multiple hard drives for each client computer. If you need to install a piece of company software for a small business, setting up a NAS (Network Attached Storage) to contain that installation will allow all of the client computers to use it without going through each computer and installing the software on each system individually. If a NAS was not used, your unused space is left wasted, while with NAS other users can take advantage of the shared space. Also, most NAS devices have some sort of hard drive redundancy system so your drive data can have a layer of data protection. So the demand for this type of solution is very much needed whether in a home or business as it can greatly reduce cost and increase productivity. Why Use a DIY NAS? You are interested in purchasing a NAS device, but are not sure if purchasing a prepackaged NAS solution is best for you or not. Typically, companies that provide all-in-one NAS solutions such as QNAP, Synology, etc, tend to cost more, are closed systems, and thus are not truly flexible in terms of using a solution that is exactly fitted to your needs whether it is related to performance, flexibility, or price. For example, you run out of space for your home NAS, so how would you expand? You could purchase larger capacity drives but if that is not an option, you would have to purchase an even larger NAS device altogether. So it isn’t very scalable solution unlike with a DIY NAS, where you can easily keep all of your components and simply add more drives since you get to choose the components beforehand. Even if you need to upgrade parts such as your computer chassis, it is much more cost effective than purchasing a completely new unit. Also unlike a closed NAS system, there is no migration of data required at all using a DIY NAS solution which is an opened NAS system. By using a DIY NAS solution, again, you get to select all of the parts for your NAS device, set your own price range, and cherry pick what type of software to use. 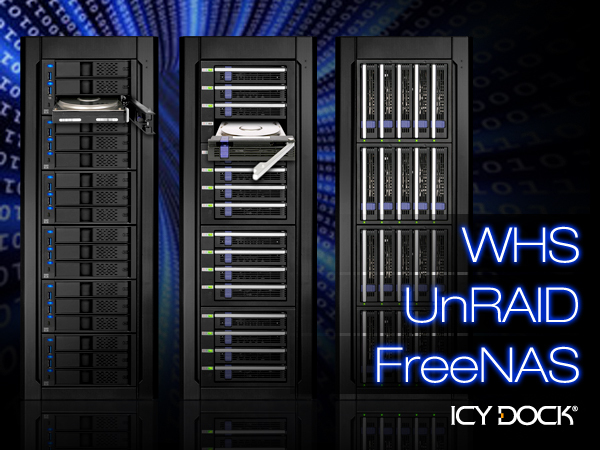 FreeNAS, unRAID, and WHS – What are the Differences? FreeNAS, unRAID, and Windows Home Server (WHS) are just some of the home server operating systems available that can be tailored into a NAS device with very flexible options. Each of the operating systems we just mentioned generally shares a few of the important functions of having a large NAS server. As far as the functions each must have is the ability to combine multiple drives into a single volume with very little work needed. This is very important because if you wanted to expand your drive capacity, normally, you would see multiple volumes under a regular Windows system. With either unRAID, FreeNAS, or WHS, you have the ability to link all of your drive data together and it will be seen as one single large volume. These operating systems usually rely on some sort of RAID storage system in order to provide better management and drive redundancy for all your files such as: movies, family photos, or recorded TV shows. Hence, these sorts of servers will be hard drive heavy since the main purpose is to use it for storing and sharing your data on a network. While we have said each choice is similar, the specific features that implement the same result are different. Features such as unRAID’s unique array technology to allow data not to be striped even though it has the abilities of a RAID 4 array, FreeNAS’s ZFS file system for local & remote data protection, backup and recovery of your NAS, or WHS with similar abilities to create a single storage volume and the ability to protect, backup and recover your connected PC’s with their easy to use streamlined design. From what you are probably able to tell, WHS is the easiest to work with as it has most of the features you will need for your NAS, but with unRAID or FreeNAS, there is more work needed to set up while makes up for it with many plug-ins and customization available to personally fit your needs. So, we would suggest reading the links below with some very helpful information. Generally, you would need to have some background about building (DIY) PC’s and how to work with them. But, we’ll talk about what you will need to build your system. The main components other than what is normally required (e.g. motherboard, CPU, RAM, etc) would be a RAID card and hot swappable hard drive storage enclosures. You may need 36TB or only 12TB of storage but either way, you would want to have a space saving and hot swappable cage that adds an extra 3.5” hard drive slot per two 5.25” slots. As you add to your collection, you may also need to expand your storage so using a 3.5” hot swap enclosure allows you to easily add new drives as needed. If your drive fails, you would want to have a way to easily swap drives as most RAID arrays from the mentioned operating systems cannot tolerate more than one drive that has failed. So, being able to replace your drive quickly is your best option to not lose all of your data. Now that we know this, we need to learn what variations of 3.5” hot swap cages are available. Many of the available cages do the essentials of storing your drives but may not have a good quality construction, design, cooling, and features specific for your NAS server such as drive monitoring or pluggable external options. It’s important to have these features as doing everything possible to prevent a hard drive failure is as important to plan in case one does happen. Fortunately, our, FatCage, FlexCage, and DataCage Classic series each posses a unique design for different situations to help you improve the reliability of your drives and tailored for specific uses. This series is specifically tailored for the best cooling performance while provide simple yet reliable design. The chassis is specifically designed to provide highly optimized airflow with larger cut outs in key locations on the circuit board and uses the largest cooling fan of all three series of 92mm (for MB155SP-B). If your target is to build a efficient, economical, and cool NAS, the FatCage is your choice. This series is specifically tailored for ultra fast tool-less hard drive installation, along with individual control & manage of each of your hard drives. Each slot includes power buttons to control power to your drive. Meanwhile, a fan control switch allows changes from automatic, high performance, or silent operation modes. Furthermore, FlexCage has front USB 3.0 hub that allows you easily connect additional external storage devices to your NAS via lightning USB 3.0 speed. If you are looking to build a JBOD type NAS, with ability to turn off any unused drives, or quick swap hard drives without tool. FlexCage is your best bet. The DateCage Classic is designed for advanced drive environment management. It is the only hard drive rack with such advanced monitoring system in the industry. The DataCage Classic allows you to monitor every possible status including: drive power, drive activity, drive overheat, drive failure and fan fail status. This proven classic features the core functionalities of an enterprise class hot swap hard drive rack with exclusive features for outstanding reliability.